Aegina. Silver stater. ca. 445 to 431 BC. Reference : Sear Greek - 2600 variety. Milbank pl II #10. SNG Delepierre 1540. SNG Copenhagen 517. Size : 16.6 x 19.0 mm. Weight : 12.38 grams. Grade : VF with a circular countermark on the tortoise's shell. There are a couple of light marks in the field to the left. Well-centred with just one flipper of the flan (back right). Obverse : Land Tortoise with a segmented shell. There is countermark on the turtles back, which appears to be a dot with a ring around it. Reverse : Incuse square with a skew pattern dividing it into five sections. 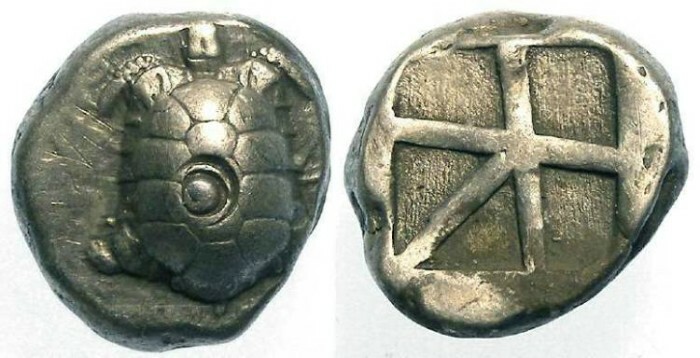 Some time during the mid-5th century BC, Aegina changed the symbol on their coin type from a sea turtle to a land tortoise. The sea turtle would have represented Aegina's position as a major sea power, and I believe this change to a land tortoise was forced on them by the Athenians, following their defeat by the Athenians in 456 BC, to signify to the trading world that Aegina was no longer a major sea power in the region.